Brighton Sea Wall, c1835: People sitting on the top of the recently-completed sea-wall in Kemp Town. This was built between 1833-1835 with an esplanade running along the top. One man is looking out to sea through a telescope. Some fishing paraphernalia, including rope and a harpoon, is resting against the sea wall and on the ground. The Chain Pier can be seen to the west. 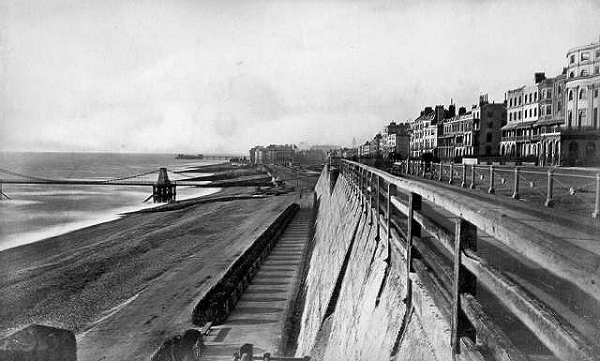 Seafront East of Chain Pier looking West, c. 1875: Seafront east of Chain Pier looking West. The sea wall on the right was built in 1827-38, with a promenade running along the top alongside the road on Marine Parade. In 1880 these wooden railings were replaced by the present cast-iron railings with dolphin motifs. 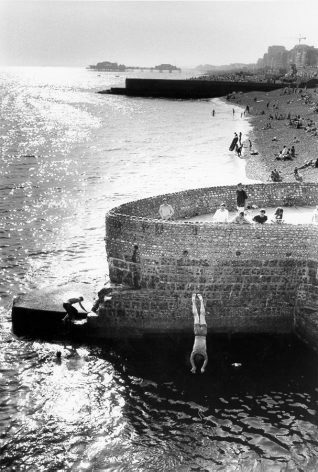 Diving from the Albion Groyne, c. 1980s: A group of people watch as a man dives into the sea from the Albion Groyne. The West Pier can be seen against the horizon. Photograph Copyright Evening Argus. 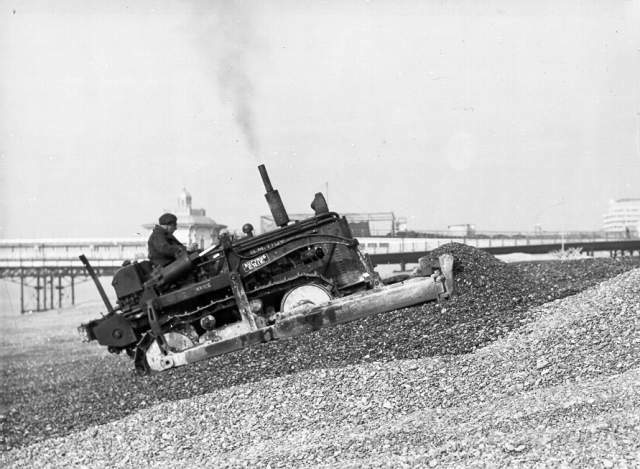 Moving Shingle on Brighton Beach, 1950: Shingle is being shifted by bulldozer on Brighton Beach. Embassy Court can be seen on the right beyond the West Pier. Saltdean 23 December 1932: This photographic print was made by Brighton's Borough Surveyor's department in December 1932. It shows Saltdean's sea defences during improvement work. The new sea defence wall is in the centre with steps running down to beach level. 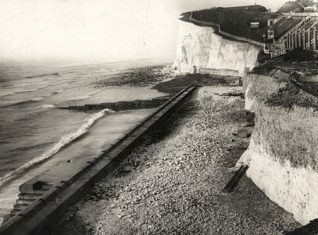 Rottingdean, 2 May 1932: This photographic print was made by the Borough Surveyor's department in May 1932. It shows Rottingdean's sea defences during improvement work. People are looking over the barriers on the promenade towards the building site. Course 7 is written in red ink on the left of the print, above a red dashed line running across the image. Undercliff Walk and Sea Defences at Ovingdean, c. 1932: Building of Undercliff Walk and sea defences at Ovingdean c.1932. The Undercliff Walk was built in 1930-33 to protect the cliffs east of Black Rock and used 13,000 tons of cement, 150,000 concrete blocks and 500 workers. 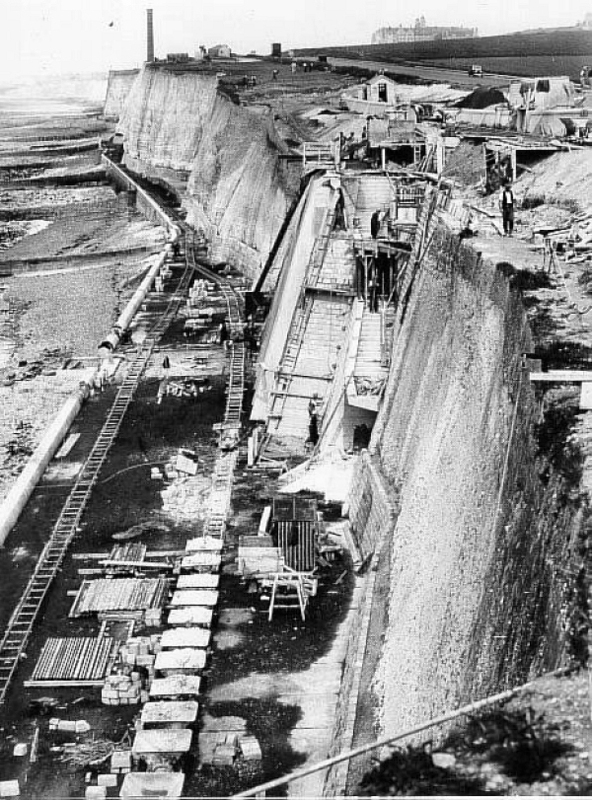 It was formally opened on 4 July 1933 by the Minister of Health Sir Hilton Young at Ovingdean Gap. Roedean School can be seen in the distance above the cliffs. Strollers taking a bracing walk on the under cliff walk below Roedean on 21 January 2007, this picture was taken from the marina. The first groynes were constructed in 1723-4. The construction of larger groynes throughout the nineteenth century has halted erosion and accumulated shingle on the foreshore to a depth of 15 feet or so, greatly increasing the size of the beaches and protecting the fragile cliffs at the same time. 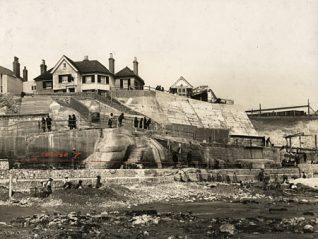 At one time, for instance, the sea came right up to the base of the East Cliff below Marine Parade, but the construction of groynes and sea-walls has extended the beach a hundred yards or so from the cliff. However, large landslips occurred at the unprotected Black Rock as recently as the 1920s. The beaches and foreshore were commercially important to the fisheries, and also to the growing passenger and cargo trade of the eighteenth and early nineteenth centuries. 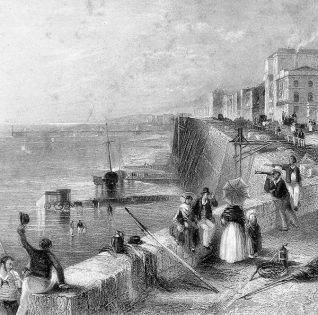 Until the construction of the Chain Pier in 1823, passengers and other cargoes were landed on the beaches and carried up the several gaps that existed in front of the town, but since the development of the ports of Newhaven and Shoreham, and also with the arrival of the railway in the 1840s, the beaches have been used principally by bathers and fisherman. During the Second World War the government closed all beaches at 5 p.m. on 2 July 1940; at Brighton they were protected by barbed wire and mines, but were cleared and reopened in July 1945.
b) GROYNES: The first effective sea-defences to be constructed at Brighton were the ‘groynes’, walls projecting into the sea at right angles to the shore. They are effective due to the accumulation of shingle on the western side, the ‘longshore drift’ in the area being from west to east. The banks of shingle thus build up around the base of the cliffs to a depth of fifteen feet or more and prevent any further erosion of the cliff by the sea. They therefore utilise one of the sea’s deadliest weapons, the shingle, to neutralise its destructive action. The first groynes, funded by Church Briefs, were started in September 1723 and completed in 1724, two wooden structures in front of the Old Town each of five piles planked with timber. By 1743 there were five groynes. Maintenance was spasmodic though and the groynes decayed badly, necessitating a second Church Brief in 1757, but the responsibility for sea-defences was one of the main provisions of the 1773 Brighton Town Act. It gave that responsibility to the town commissioners and established a coal-tax to provide funds for ‘building and repairing groyns, to render the coast safe and commodious’ (sic). Duty was charged on ‘sea-coal, culm or other coal landed on the beach’ at Brighton at the rate of sixpence per chaldron (36 bushels), but was increased by the 1810 Town Act to three shillings per chaldron. Tollgates were established at the parish boundaries following the 1825 Town Act which extended the tax to all coal brought into the town, and by the 1840s coal-tax was bringing in about £6,000 to £8,000 annually. Although the town commissioners were dissolved in 1855, coal-tax at Brighton continued until 1887. By 1808 there were also four groynes below the East Cliff, and in about 1813 a groyne 120 feet long was constructed behind Russell House. Many more wooden groynes were built in the nineteenth century, but the first concrete groyne was constructed in 1867 at East Street; it also proved very successful as a free promenade pier 195 feet long. A second concrete groyne, 275 feet long, was constructed in 1876; initially known as the Aquarium Promenade Groyne, it later became the Albion Groyne and was doubled in width in 1896 when the storm water outfall was enlarged. Both groynes were lit by gas to aid the fishermen at sea. The Banjo Groyne was built in 1877 and derives its name from its shape; officially it is the Paston Place Groyne. It provides a promenade about 270 feet long and 14 feet wide, has walls over 3 feet thick, and by 1884 had reclaimed several acres of land enabling the Madeira Lawns to be laid out. The other concrete promenade groynes are the Norfolk Groyne of 1894, and the Black Rock Groyne which was completed in 1895.
c) SEA-WALLS: The first sea-wall, to protect the base of the cliffs directly, was built by the proprietors of the New Steine and other East Cliff residents in about 1795, a simple flint structure along the foot of the cliff. The sea came right up to the bottom of the cliffs at this time, and the town commissioners built a similar wall for some distance along the same cliff in 1809. The construction of the Chain Pier in 1822-3 involved a mortar sea-wall some yards in front of the cliff to carry the new promenade, but the greatest improvement came in 1830-3 when a huge cement wall was built along the face of the East Cliff from Old Steine to Royal Crescent, further protected by large amounts of rubble which were tipped over the cliff top until they rose to half the height of the cliff. By 1838 the new wall had been completed to join the wall of the Kemp Town estate. Constructed by William Lambert at a total cost of £100,000, the massive structure is 23 feet thick at the base and up to 60 feet high, and has a large commemorative plaque above the Madeira Terrace to the west of the Madeira Lift. The rubble mounds were levelled for the construction of the Madeira Drive in 1872 when a smaller esplanade sea-wall was constructed to the south. 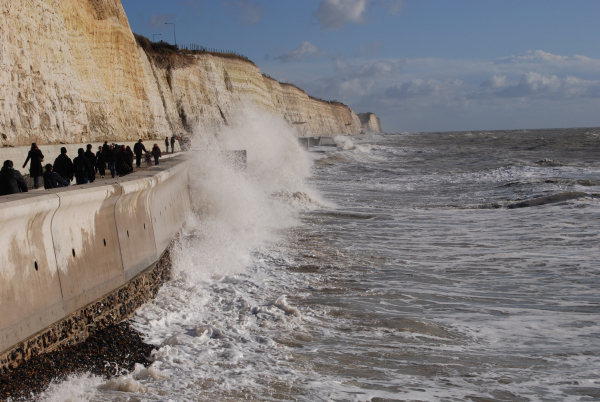 In the 1930s a sea-wall over three miles in length, the Undercliff Walk (q.v. ), was constructed from Black Rock to Saltdean. The western cliffs in front of the Old Town were first protected by a wall in 1811 when a flint and limestone structure was built between Black Lion Street and Ship Street. This was extended to West Street when the King’s Road was constructed in 1821-2, and to East Street in 1825-7; by 1829 the build-up of shingle by the groynes enabled the construction of the Grand Junction Road and the extension of the sea-wall to meet the Chain Pier promenade. It was extended further westwards in 1853 to the West Battery (in front of the Grand Hotel), and to the Brunswick Town sea-wall at the Hove boundary in 1894.
d) DESCRIPTION: The sea-front at Brighton has long been dominated by its cliffs. To the west of Pool Valley, which is the natural drainage point for most of Brighton, they rise to a height of about 40 feet in front of the Old Ship before tailing off towards Hove, but have become obscured by the accumulation of shingle and the extension of the King’s Road promenade above the King’s Road Arches; the actual cliff edge roughly follows the building line of King’s Road. These cliffs are composed of ‘Head’ (or ‘Coombe’) drift, an easily eroded deposit of chalk rubble and flint with a proportion of clay and sand which outcrops in all the valleys of Brighton and westwards along the coastal plain to Shoreham. In front of the Old Town the cliffs were known as Middle Street Cliff, Ship Street Cliff, Black Lion Street Cliff and the East Cliff, and were separated by gaps with steep paths to the beach along which cargoes were conveyed. To the east of Pool Valley the Coombe deposits rise again to form what is now known as the East or King’s Cliff, which reaches 80 feet at Eaton Place. Since the 1830s the whole length of the East Cliff from the Aquarium to Kemp Town has been protected by a wall. At Black Rock, where the deposits are still exposed, the solid chalk of the South Downs meets the sea and a long line of white cliffs then stretches to Newhaven with gaps at Roedean, Ovingdean, the deepest at Rottingdean, and at Saltdean. Averaging roughly 100 feet, these cliffs rise to about 135 feet between Rottingdean and Saltdean, and to 200 feet to the west of Newhaven. At Black Rock (q.v.) and Saltdean the cliffs have been designated as sites of special scientific interest for their geological formations. 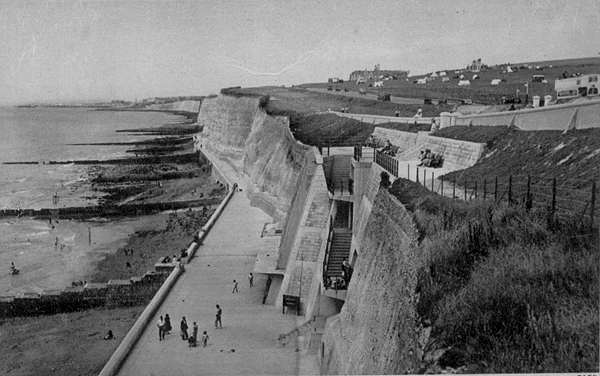 Brighton’s coastline, just 2.2 miles long before 1928, now stretches 5.4 miles from the Hove boundary to Saltdean, and is protected for its entire length by groynes and walls. All the town’s beaches are owned by the council, and since 1979 have been known as (west to east) Boundary, Norfolk, Bedford, Metropole, Grand, Centre, King’s, Old Ship, Volk’s, Albion, Palace Pier, Aquarium, Athina, Paston, Banjo, Duke’s, Cliff (naturist), Crescent, and Black Rock beaches. Although predominantly composed of shingle accumulated by groynes, the beaches do have sizeable stretches of sand between the Palace Pier and Black Rock, especially at low tide. To the east of the Marina the tide retreats further than in front of the town and the solid chalk foreshore is exposed beyond the small accumulations of shingle which protect the Undercliff Walk, a feature that allows visitors to explore the many delightful rock pools. There are also small bathing beaches at Ovingdean, Rottingdean and Saltdean Gaps.